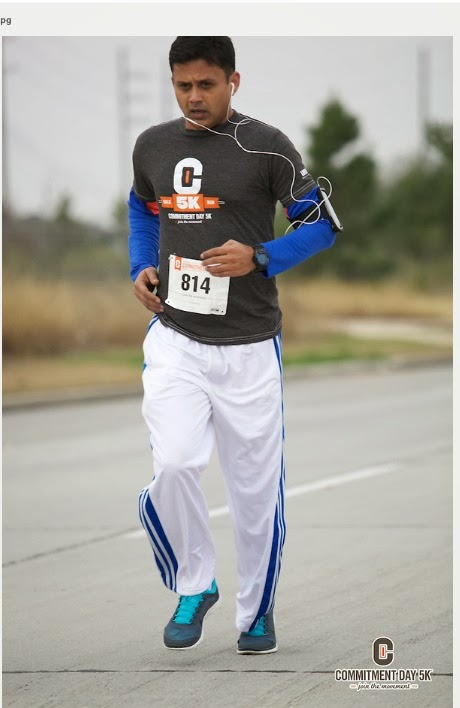 Today I will share my first running event of 2014 on Jan 1st – a Fun Run/Walk dedicated to starting a national conversation about living a Healthy Way of Life. What a fine way to start the New Year, besides going to the temple or staying at home. After attending a new year’s party on the night of the 31st, it was not easy for me to wake up early in the morning, and drive for 20 miles to get to the run. However, I knew that the post-race satisfaction would triumph over the unease of leaving the bed so early on Jan 1st considering I slept around 2 am the prior night and refrained from drinking barrels of scotch at the party. As expected, hundreds of enthusiastic runners were present at the event ready to start the year with a resolution to become healthier and happier. Post event ceremony was also gratifying when event directors reminded everybody that “we are different” than millions of people around the world who would still be in their bed with a hangover or a headache. I could feel the pride in the air as many people around me felt contented and accomplished. In my upcoming blogs, I will share many more stories and experiences for all my readers to enjoy and consume. I would consider my blogging effort to be successful if I could motivate even one of my readers to take a little step out of their comfort zone towards making life more healthy, eventful and fulfilling. Nice post. I also participated in the commitment day race. Gone through. Its motivating. I will not dissappoint you.... i will make a move for sure. Let me know if you need any suggestion or you can read my other blog topics.